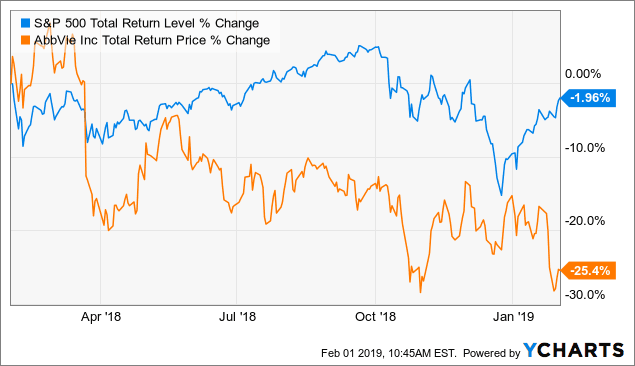 The Dividend Aristocrats are companies of the S&P 500 that have paid steadily increasing dividends for at least 25 years have outperformed the broader market over time, like in 2018. This article lists the current Dividend Aristocrat constituents and their recent returns including the month January 2019. The 4 new dividend aristocrats, added to the list by S&P, are also included. The Dividend Aristocrats started the first month of the year 2019, with a positive performance, recovering somewhat from the negative performance last December. The Dividend Aristocrats index total return is 5.40% for last month. This is below the total return of the benchmark S&P 500-index, the S&P 500 (SPY) is up 8.01% in January. Traditionally, the out-performance by the Dividend Aristocrats has occurred in down markets, like last year. So, the under-performance of 2.61% in January is not a surprise. 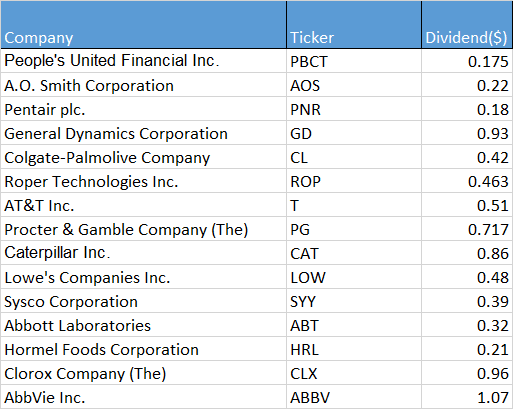 On January 24th, 2019, S&P Dow Jones indices announced that Chubb (CB), Caterpillar (CAT), People’s United Financial (PBCT), and United Technologies (UTX) were added to the Dividend Aristocrats Index. These changes will be effective prior to the open on February 1st 2019. As from February the Dividend Aristocrats will have 57 constituents. All four are meeting the criteria to become a member of the dividend aristocrats list, include the 25+ consecutive years of dividend increases. People’s United Financial (PBCT) is an interesting regional bank in the US with a (high) dividend yield of 4.15%. Chubb (CB) is a well-managed, diversified insurance company, but at the moment not attractively priced, given the relevant pe-ratios and the modest dividend yield. United Technologies and Caterpillar are both active in the sector Industrials. 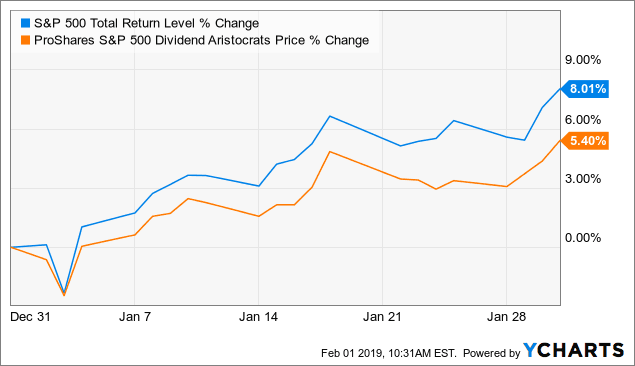 A four new dividend aristocrats went up in January. The table below shows in performance of the four new dividend aristocrats sorted descending by last month’s performance. The table below lists all 57 constituents, including the 4 new aristocrats sorted descending by last month’s performance and lists returns over last month, 3-, 6-, and 12-month periods. The top performers in January were Dover (+23%) and Nucor (+18%), AbbVie (-12.9%) and McCormick & Company (-11.2%) were down. AbbVie’s share price has already spent much of 2018 falling and continued further down in the first month in 2019. This is mainly due to fears of biosimilar launches in the EU to its blockbuster immunology drug Humira. Which has been confirmed by the companies latest earnings results and the 2019 guidance. However given Abbvie’s long-term plan and drugs pipeline, the sell-off by investors looks a bit overdone. AbbVie is one of the undervalued Dividend Aristocrats and has also an interesting 5.33% dividend yield. The average price target is set at $95.76 (17 analysts). Once the share price of AbbVie reaches levels above the SMA-200, the stock might become interesting from technical point as well. Next to dividend growth investing, high yield dividend could also be an approach. 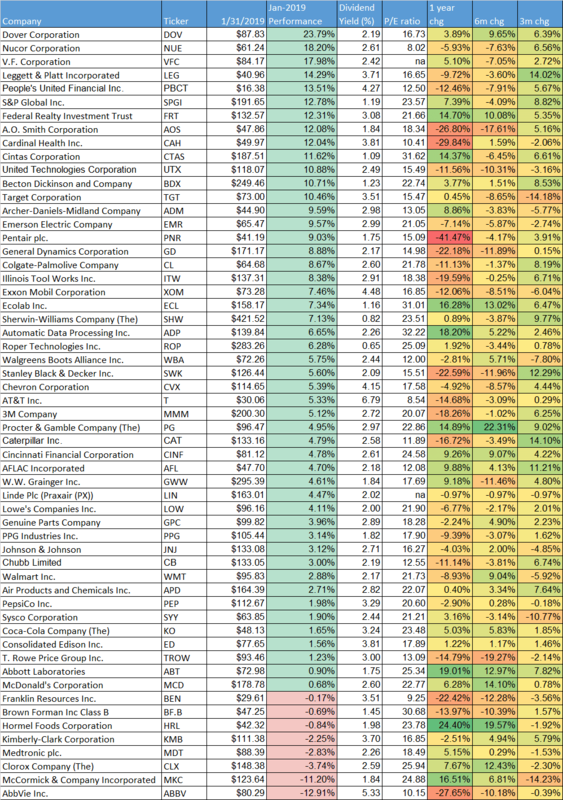 The table below lists the top-10 Dividend Aristocrats sorted descending by current dividend yield. Please note that selected high yield Dividend Aristocrats is historically not a way to outperform the S&P 500. Back-testing of the Dogs of the Dividend Aristocrats over the past years resulted in an under-performance with respect to the S&P 500 index. The January performance is based on the difference in share price, so price return. For the total return, the dividend paid should be taken into account. In January already 15 dividend aristocrats went ex dividend. The table below shows in dividend aristocrats and the dividend amount for January 2019. Investors looking for a strategy based on dividend growth, the new Dividend Aristocrat People’s United Financial (PBCT) might be the most interesting out of the 4 new members. The above presented performance data of the Dividend Aristocrats, could assist active dividend growth investors to find some bargains for the long run.